Train indoors all winter long! hooks up to just about any bike--including road and Mountain bikes with a 26 inch to 28 inch, or 700cc wheel!! get off the couch and onto the state of the art rad max gonzo Trainer by RAD Cycle Products, specifically engineered for fitness and endurance indoor training. Out of all the trainers we tested, none of them compared to price and the quality of this Trainer! regardless of the weather outside you will be able to stay in shape. 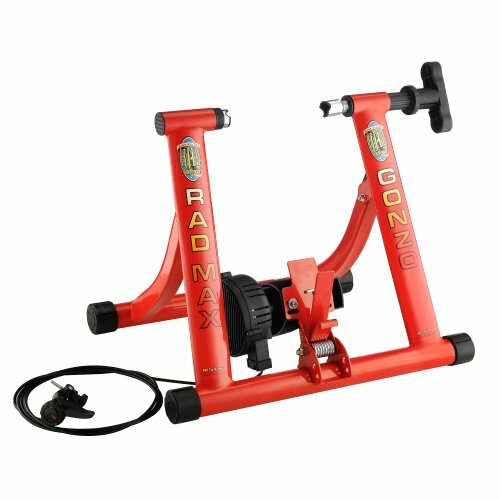 The rad max gonzo Trainer by RAD Cycle Products offers seven levels of powerful magnetic resistance so simulate multiple road conditions. The max racer Trainer converts your bike into a dynamic indoor cycling Trainer. It utilizes a state of the art magnet system which provides progressive magnetic resistance increases as the speed increases. These are perfect for the beginner or the professional who wants to stay in shape all year long! this mag Trainer is one of the quietest on the market - it is a premium quality unit. Now you can watch TV and ride your bike. Designed for bikes with quick release rear axle. 7 powerful magnetic resistance levels simulate road conditions. Wide base design for extra stability and a smooth, quiet ride. EZ change resistance controller clamps to your handlebars. Customize your workout with resistance levels and gear changes. Train safely away from traffic areas year around. No-slip floor grip stabilizes front wheel. Trainer folds for easy storage. Riser block included. Accommodates 26-28 and 700cc tires. Brand - RAD Cycle Products. 1099 Gonzo Bike Trainer - 1099 Gonzo Bike Trainer. Shipping weight - 18. Item dimensions - H 18 x L 15 x W 21.25 .